Just 1.5 km from the beach and the village of Platja d'Aro, the Valldaro campsite welcomes you for your next holidays. Right on the Costa Brava, the fantastic Valldaro campsite is a must see during your Spanish holidaying! This vast 4-star campsite in Platja d'Aro, with its tropical design, promises a perfectly comfortable stay. What's more, it's located in a beautiful region just a stone's throw away from Pals (26 km), Girona (34 km), Tossa de Mar (32 km) and Montserrat and its abbey (133 km). Thanks to the beauty of this part of Catalonia and the proximity to the beach of Platja d’Aro, this campsite is sure to be the best place for your family getaways. Pools, fun facilities (play area, sports field…) and top quality services (restaurant, bar, snack-bar, grocery store and laundry room) will make your stay marvellous. Dive into the pools or unwind in the warm afternoons sun or under the shade of the palm trees. Here, at this real holiday village, every family member will find something to enjoy! Your little one will find some of their favourite activities at the kids club whereas adults can discover the unique entertainment (peak season) organised at this family-friendly site. Challenge friends to a game of tennis, volleyball or even football. Various daytime and evening activities, such as evening shows, can be discovered. Furthermore, if the urge should seize you, play golf, fish and devote yourself to the joys of water sports. To round off your stay, don't hesitate to visit the old town of Tossa, walk on the 'wild side,' and why not, with a beautiful cruise to discover the marvels of the region and breathtaking natural sites on offer. Caldas de Malavella station (25 km). 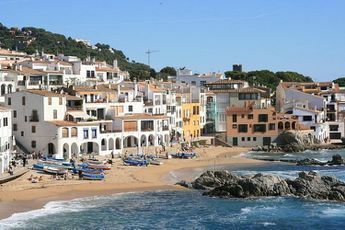 Nearest town : Platja d'Aro (1,5 km). 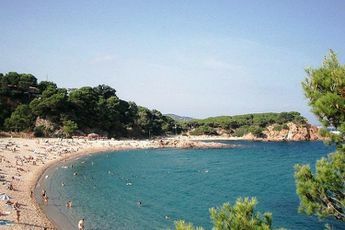 The Valldaro campsite is in the very centre of the costa brava ('wild coast'). From the north to the south, it spreads out with its peaceful fishing ports and beaches of fine sand. In this area, which has become popular with tourists, you might still find some deserted coves that provide isolation. Dali, child of the country, is omnipresent. Between his home village, Cadaquès, and his museum of Figueras, you will enter into his artistic world. Your holidays in Catalonia will be a real change of scenery.